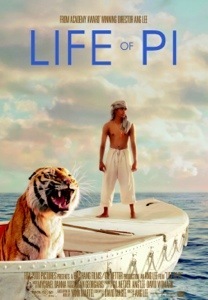 We are behind the box office calendar, and finally viewed the critically acclaimed Life of Pi last night with our kids. It was a fantastical story told with some pretty spectacular and beautiful cinematic images. The action and drama kept me engaged throughout the entire film. However, It did become evident in the first few scenes that the writer embraced and promoted a ‘multi-pathways to God’ worldview. I wasn’t surprised because the family in the story was from India, but I was not looking forward to cultivating an argument of why polytheism doesn’t work with the God of the Bible for the next two hours. I contemplated turning it off, but then realized this was a great teaching moment for me and my kids. I’m not a fan of the ‘stick your head in the sand’ approach to opposing world views. I would rather be knowledgeable and empower my kids with facts rather than leave them vulnerable with only pragmatic arguments to defend their faith. In our brave new world they’re exposed to all kinds of ideas, and this movie gave me the opportunity to witness how they sort out polytheism when presented with it in such a pretty and persuasive package..
Perhaps the most powerful moment is when the listener is given two possible true stories and asked which they prefer…the writer points out that neither version changes the outcome, or the underlying purpose of the story …only tells it in a different way. Sounds lovely and artistically abstract and enlightened, doesn’t it? Unless you love truth, seek truth, and believe there can only be one truth. In that case, you want to know which story is the right one. After all…they can’t both be true. Common sense negates that theory on a basic level. So here is where I fell off the writer’s polytheistic metaphor…although it was a well-versed and fantastically presented one…I found it a bit impotent in the end. I’m still monotheistic…one God and one Path. Overall, yes, the film was beautiful and entertaining, but it is what it is… Polytheism101. Tagged Aimee Jones, Life of Pi, movie review, polytheism. Previous: Previous post: Oh Brother Where Art Thou? Next: Next post: Launch, Donuts, and Faith…These Are a Few of My Favorite Things. It might start out slow but once Pi is on the boat with the tiger, you are immediately sucked into the turmoil of everything that happens and left with a sense of hope, awe and wonder at the very end of it. Nice review Aimee.